Bernd Marin has been named director of Webster University’s Vienna campus, effective Oct. 15. Marin joins Webster from the United Nations-affiliated European Centre for Social Welfare Policy and Research, where he held the post of executive director from 1988 until 2015. 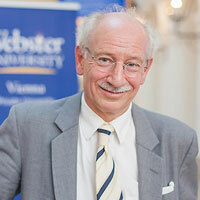 “We are delighted to welcome Bernd Marin to the Vienna campus, where students from over 70 countries are educated for the global labor market and where people from 30 nations are employed in research, teaching and administration,” said Julian Schuster, Webster’s provost, senior vice president and chief operating officer. “Bernd is not only an accomplished and internationally acknowledged scholar, but also a bold personality and a creative mind." The possibilities for development at the campus, known locally as Webster Vienna Private University, attracted Marin to this opportunity. “This is one of the most challenging and fascinating tasks in the field of scientific and educational management in Vienna,” Marin said. “I also think it is simply great that American universities in Europe offer careers for younger as well as for more experienced scientists and academics. And above all, a Webster degree is a universally valid passport to the world's international labor markets of the 21st century." Future plans for the Vienna campus also include strengthening the international academic network by establishing endowed professorships. Marin was also previously the director of the Institute for Conflict Research in Vienna from 1975 to 1984. In this period he also completed his Habilitation in Linz and carried-out post-doctoral research at Harvard University. He has considerable experience teaching and conducting research at a number of prestigious universities, including Harvard, M.I.T, Columbia, New York University, New School of Social Research, Sciences Po, Cornell University, Kent, Berkeley, University of California Los Angeles (UCLA), Tokyo, Buenos Aires, Amsterdam, and many others. Read more about Marin's background and see additional photos in this announcement at Webster Vienna.